Hey there! This is Chapter 5, Part Two of my epic tale. If you’re new, then please click here to read my story from the beginning! Enjoy! Bring the magic home today with a high resolution print! 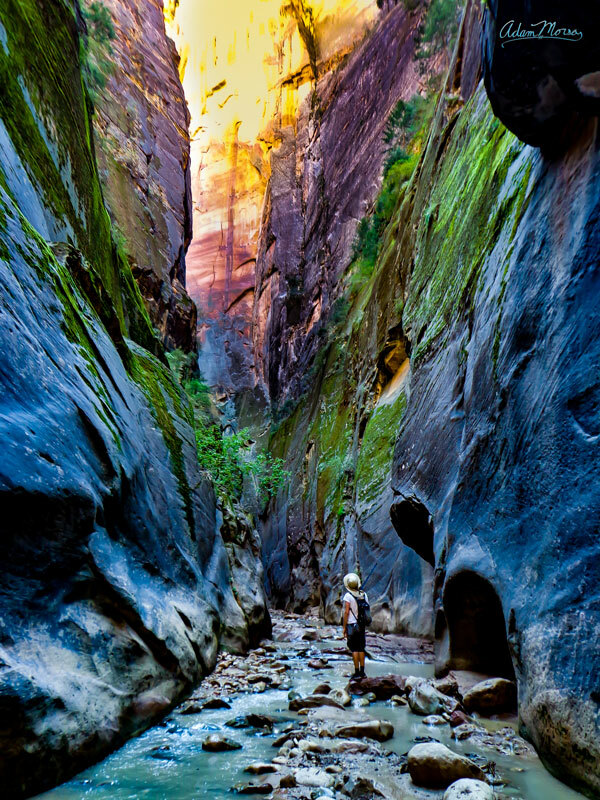 The late afternoon light peeks into The Narrows of Zion and paints a wonderland of color upon the canyon’s sheer, mossy walls as our intrepid hero looks on! I woke the next morning refreshed by the stormy night and excited for the day’s adventure. Me any my camping buds Mac & Sean had breakfast together, picked up some film for Mac’s camera, and caught a shuttle for the Temple of Sinawava- a gorgeous natural amphitheater of red and white sandstone, and gateway to The Narrows. 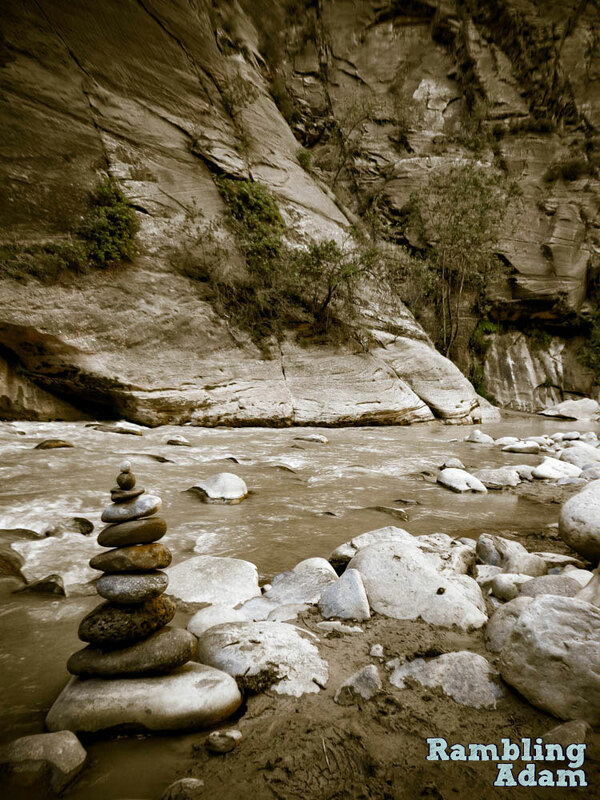 We set out on the Riverside Walk, a flat and easy one-mile stroll along the Virgin River. 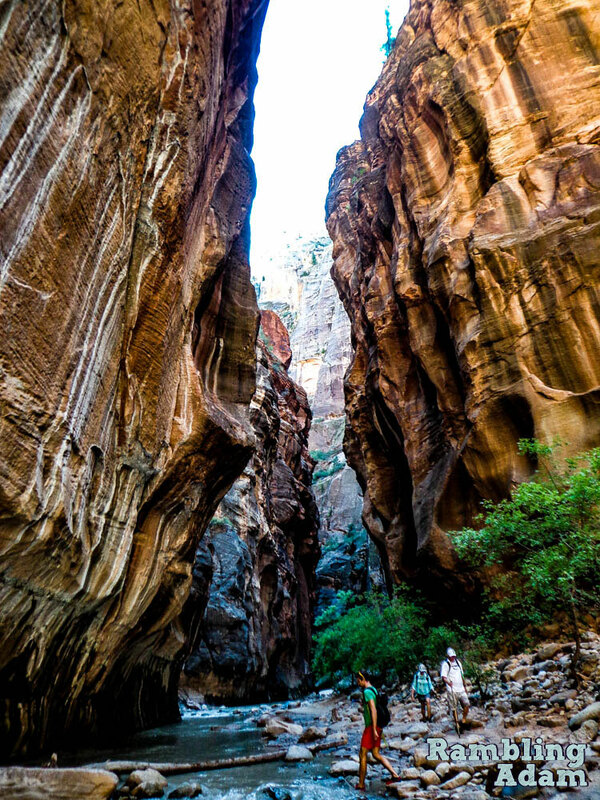 Crowded with families and tourists speaking a dozen languages, this trail allows those without the time or ability to hike the Narrows proper a chance to experience the beauty of the river winding among the towering, vertical canyon walls. 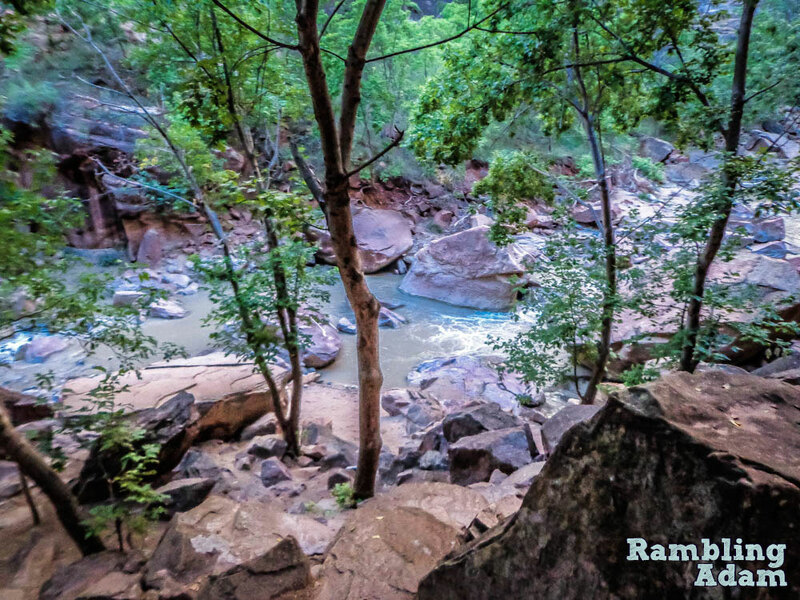 The Riverside Walk trail is an easy stroll into the canyon carved by the Virgin River. At its end is the start of one of the coolest hikes in the world. The river peaks out at the passersby on the Riverside Walk trail. It’s modesty here belies its width and depth further upriver- where we are headed. A mile upriver, the paved trail ends with a short staircase descending to a rocky shore. This is where the Narows begins. There is no more trail. The river itself is the trail, and much of the hike is more wading than walking. By the time we return we will be soaked to our necks. 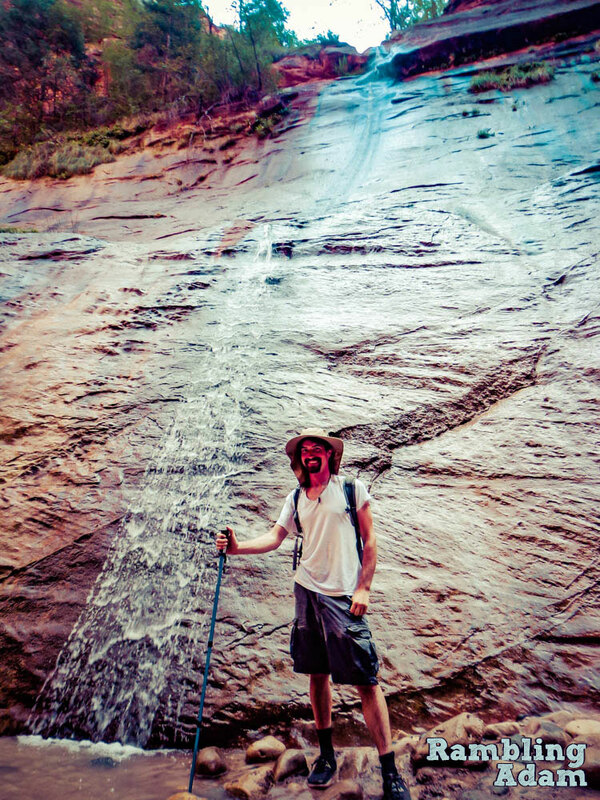 On a hike like this a walking stick or pole of some sort is necessary. The river’s floor is covered by smooth, slippery stones, and the water itself is opaque with the sediment it carries. Without a staff to act as a third leg to steady yourself, a wet and painful slip is guaranteed. Leaning against the canyon wall nearby are a dozen thick sticks left by previous hikers. Sean takes one suited to his size. I lend one of my hiking poles to Mac. My young companions are brimming with excitement, their eyes and smiles wide as they look upriver, where the shore disappears into the water. 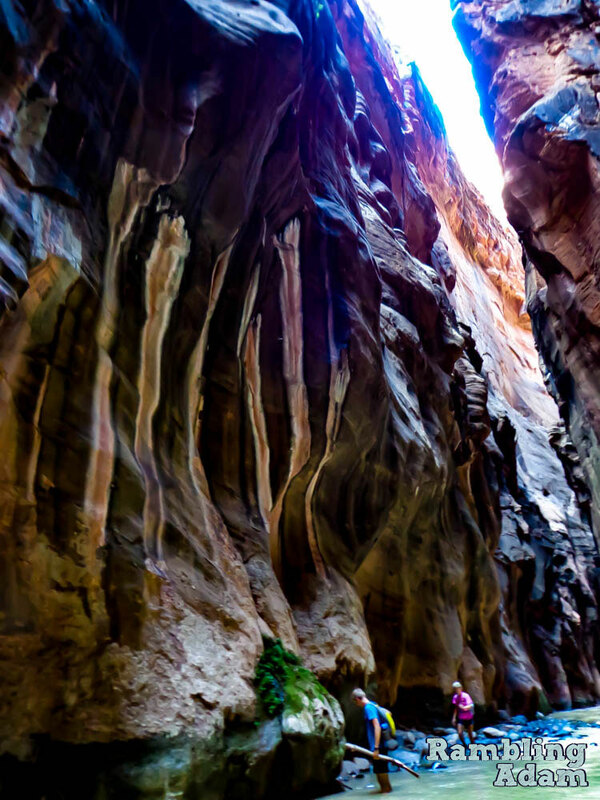 The light and wonder in their faces brings me back to my first time experiencing the Narrows many years ago. It is a thrill to experience it anew again through their eyes. We march upriver, our shoes splashing into the water. A lovely stranger takes a photo of us before we embark on our river adventure. How adorable are we!? The start of the hike is crowded with people, and the sounds of nature are overridden by the laughter of children and idle chatter, adding a slightly uncomfortable theme-park vibe to the wonder of the canyon. The ever-increasing popularity of the National Parks is difficult for me to reconcile. I love that so many people are getting outside and experiencing the beauty of the Parks(in fact I personally encourage others to visit them at every opportunity), yet I am deeply saddened by the impact so many visitors have on these serene places. The noble mission of the National Park Service is to preserve unimpaired the natural and cultural resources of the Parks for the enjoyment, education, and inspiration of this and future generations. They have done a fine job in the face of growing attendance and an increasingly restrictive budget forced upon them by politicians blind to the intrinsic value of natural beauty. As we splash through the deepening water alongside a dozen other groups, I utter a silent prayer to the Wilds that the Park Service gets the resources it needs to continue to protect and preserve these places. This spring has been flowing on every one of my many visits to The Narrows over the years. Note the raising waterline inscribed on my shorts. Moving ever upstream, we come to points where the only way to progress is to wade. We cross pools knee-deep, waist-deep, then chest-deep where we have to hold our gear above our heads. The tight chasm conceals the way ahead. Around every bend a fantastic new tableau of stone and water and life reveals itself. High, high, high above, an evergreen forest tops the canyon walls. All of us are drunk on the grandeur of it all. It is worth mentioning that among this grandeur is no small amount of danger if you are not aware of the weather. If there is rain on the forecast, then do not enter the canyons. 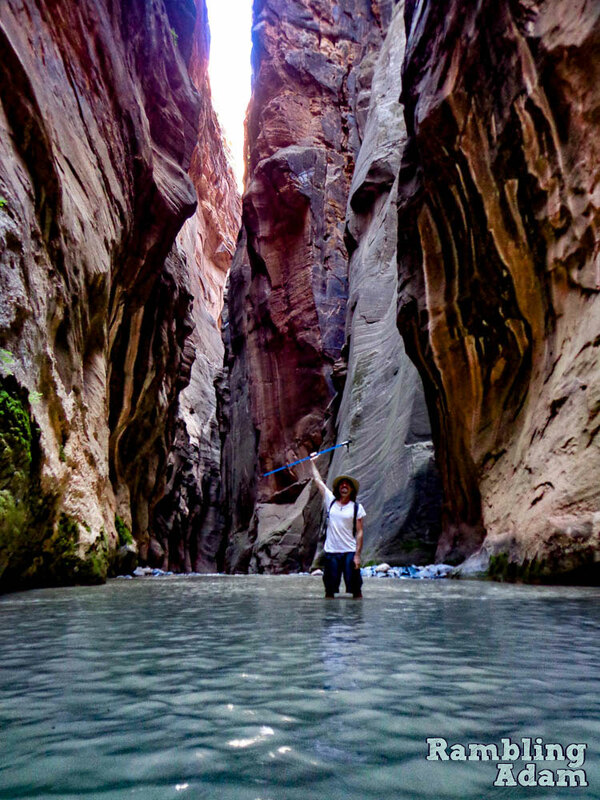 Flash floods course through the Narrows with every storm, where the water level can rise a dozen feet in minutes as water cascades in from the many hanging valleys which drain in to the Virgin River. The walls are too sheer to climb- there is no escape from the violent floods which carved this beautiful rift in the Earth. Anybody who gets the chance should undertake this unique hike- but watch the weather and seek the advice of the rangers first. People have died here. Don’t become one of them. No where to hide from flash floods here. Be wary. 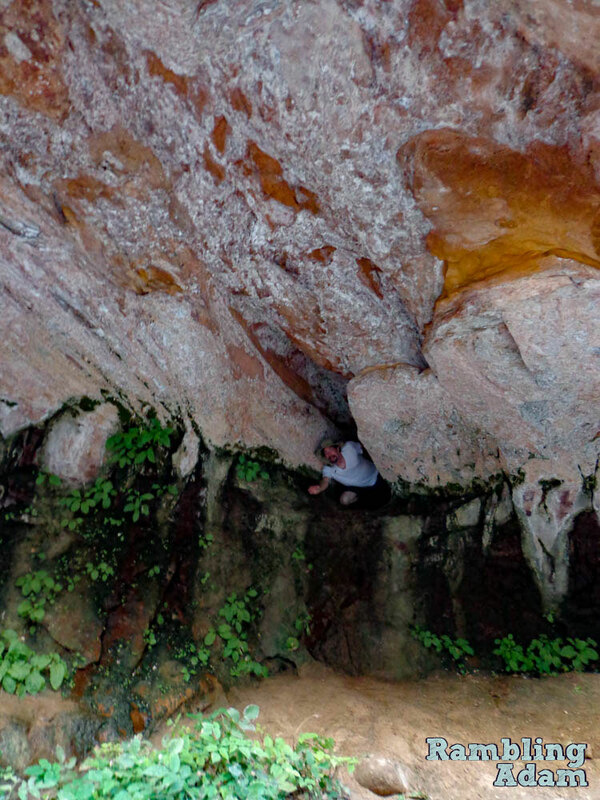 The man-eating walls are one of the lesser known dangers of hiking the Narrows. 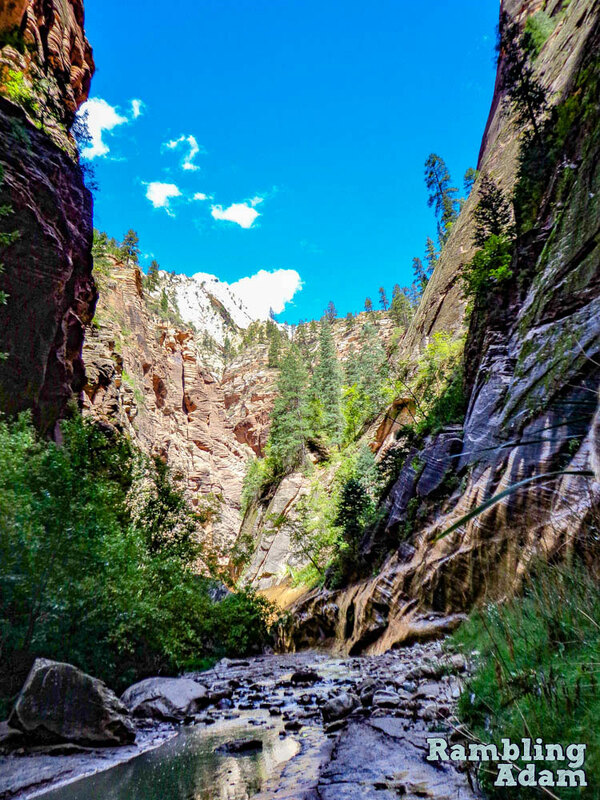 All in all, our trio hikes two and a half miles upriver to the confluence of the North Fork virgin river and Orderville Canyon. We break here, relaxing on the shallow shore, contemplating the slim strip of sky above us. I wander a hundred feet up Orderville Canyon, where the mossy walls and the angle of the sunlight came together to paint an incredible mixture of colors on the canyon. The light and colors at this juncture and time of day were beyond belief. There is more to explore, but time grows short. Our last glimpse up Orderville Canyon before we turned around to head back. I had never been past the confluence before. Big Spring, the furthest point which day-hikers without permits can reach, is another 2.5 miles out, making for a full ten mile round-trip hike. After lunch, however, my companions are ready to head back- and looking over my dwindling food supplies, I must acquiesce to our return as well. We start back downstream. I look over my shoulder, farther up-canyon, towards places I’ve never been. I swallow back a twinge of envy towards the other hikers who are continuing further on. It’s alright, I tell myself. Next time, It’s Big Spring or bust. These beautiful bold stripes are the only remnants of ancient tiger battles which once raged across Utah. Hiking, wading, and swimming, it takes another couple hours to get back to the shuttle stop. We are all drenched and exhausted from fighting our way through the river’s current, but smiling. Mac and Sean beamed as only true adventure lovers could. 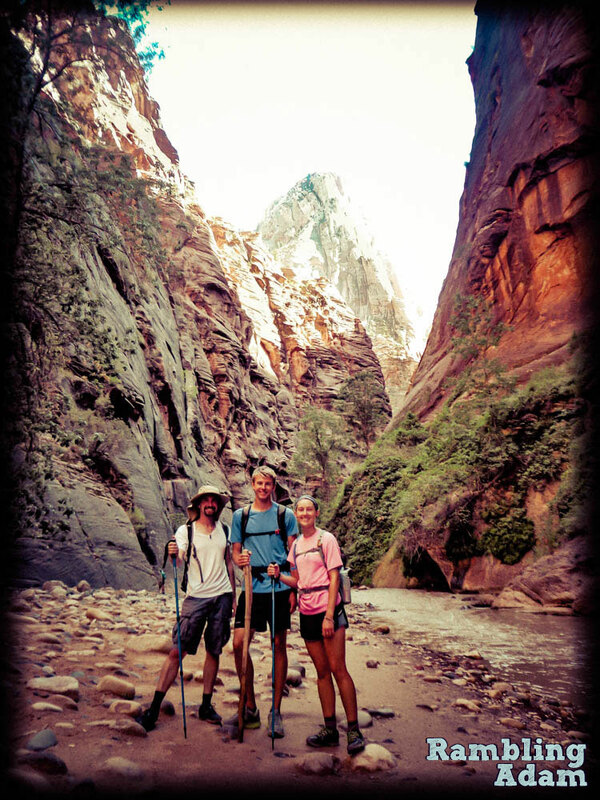 I am honored and thrilled to have given them their first taste of the wonders of Zion. So concludes our six mile round trip along (and through) the Virgin River. Back at camp, we have a filling dinner while recalling our favorite bits from the hike. Mac and Sean tell me about places to see when I reach the Pacific Northwest- the sandy shores of Cannon Beach in Oregon, the Mount Scott trail overlooking Crater Lake, and an exceedingly magical place called Artist Point in Washington. Many months later, Artist Point would become my absolute favorite place in the whole goddamn world, but that is a tale for another day. We end the night quietly around the campfire. Mac and Sean are going to Bryce Canyon National Park tomorrow, another of my favorite parks only an hours drive from Zion. I give them some exploration recommendations for their trip before we all head to bed. I was saddened by the pending departure of my wonderful new friends. 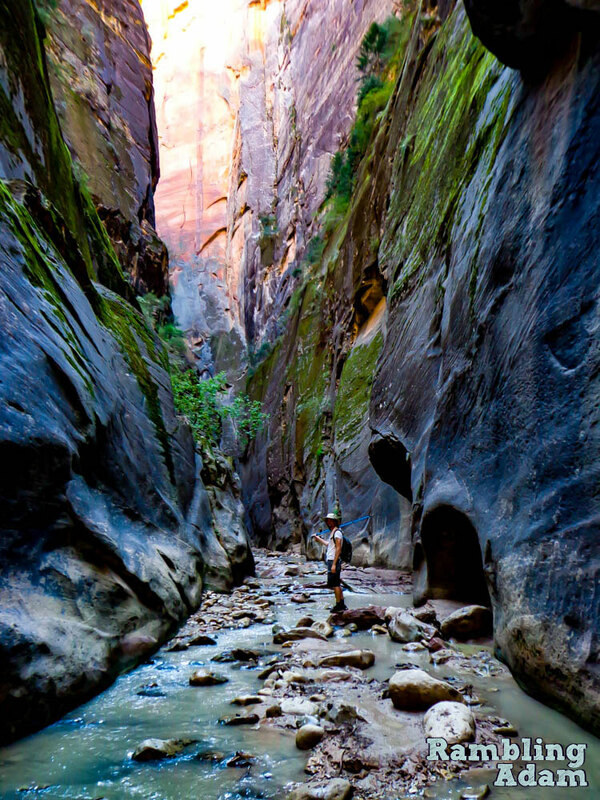 One day is not nearly enough time in places like Zion! It seemed an injustice that they were leaving so soon. First Jon, then Kira, now Sean and Mac… it was only after I left my old world behind that I came into contact with true kindred spirits, after a lifetime of feeling out-of-place in literally every social situation. We had connected in such a… simple and clean and true way. I didn’t want them to go. 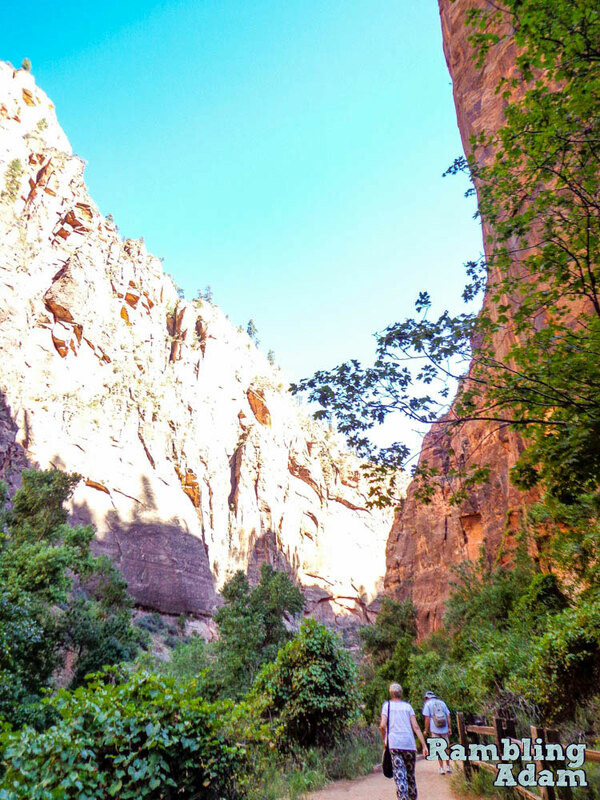 And yet, the excitement of spending the next four days in Zion, tramping my favorite old trails alone and empowered by my solitude, kept my spirits high even as their departure loomed. The fireside beers helped, too. Besides, I would see them both again, somewhere further along my long and lovely road. 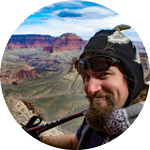 Join me next time for more incredible hikes and images from The Promised Land! 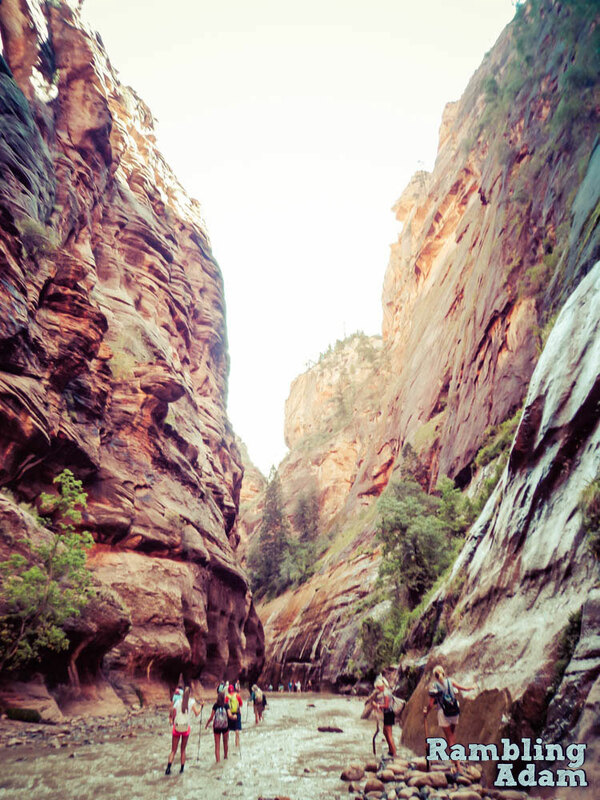 Zion: The Promised Land, Part Three coming soon!